Provides basic consumer health information about risk factors, symptoms, diagnosis, and treatment of disorders of the heart and blood vessels, along with prevention strategies and concerns specific to men, women, children, and minority populations. Includes index, glossary of related terms, and directory of resources. Chapter 1—How the Heart Works. Section 2.2—Risk Factors for Stroke. Section 2.3—Smoking and Cardiovascular Disease. Chapter 3—Conditions That Increase the Risk of Cardiovascular Disorders. Section 3.1—Depression and Heart Disease. Section 3.2—Diabetes and Cardiovascular Disease. Section 3.3—High Blood Pressure and Heart Disease. Section 3.4—High Cholesterol and Heart Disease. Section 3.8—Stress and Cardiovascular Disease. Chapter 4—Aging and Cardiovascular Disease. Chapter 5—Recent Research on Cardiovascular Disease. Section 5.1—When HDL Cholesterol Doesn’t Protect against Heart Disease. Section 5.2—Most Americans’ Hearts Are Older than Their Age. Section 5.3—Study Adds Evidence on Link between PTSD and Heart Disease. Section 5.4-Air Pollution May Be “Hard” on the Body’s Blood Vessels. Section 5.5—Seafood Consumption Can Reduce Risk of Heart Disease. Section 6.1—Researchers Discover Underlying Genetics, Marker for Stroke and Cardiovascular Disease. Section 6.3—Risk Factors Identified at Diagnosis Help Predict Outcomes for Children with Rare Heart Condition. Section 6.4—Researchers Find Gene Variant Linked to Aortic Valve Disease. Chapter 7—Warning Signs of Cardiovascular Emergencies. Section 7.2—Warning Signs of a Stroke. Chapter 8—What to Do in a Cardiac Emergency?. Section 8.1—Heart Attack and Sudden Cardiac Arrest: How Are They Different?. Section 8.2—What to Do during a Heart Attack?. Section 8.3—Symptoms and Emergency Treatment of Cardiac Arrest. Section 8.4—What to Do during a Stroke?. Section 18.1—What Is an Arrhythmia?. Section 19.1—Heart Valve Disease: Overview. Chapter 21—Infectious Diseases of the Heart. Chapter 27—Disorders of the Peripheral Arteries. Chapter 30—Cardiovascular Disease in Children. Section 30.2—Kawasaki Syndrome: A Disorder with Cardiovascular Implications. Section 30.3—Rheumatic Heart Disease in Children. Section 31.1—Men and Cardiovascular Disease: A Statistical Overview . Section 31.2—Cardiovascular Implications of Erectile Dysfunction. Section 31.3-HIV-Infected Men at Increased Risk for Heart Disease. Chapter 32—Cardiovascular Disease in Women. Section 32.1—Basic Facts about Heart Disease in Women. Section 32.3—Menopause and Heart Disease. Chapter 33—Cardiovascular Disease in Minority Populations. Section 33.1—Cardiovascular Disease among U.S. Racial and Ethnic Minorities: Some Statistics. Section 33.2—African Americans and Cardiovascular Disease . Section 33.3—Cardiovascular Disease in the Hispanic Population. Section 33.4—Things to Know about Cardiovascular Disease in Asian Americans. Chapter 34—Recognizing Signs and Symptoms of Heart Disease. Chapter 35—Blood Tests Used to Diagnose Cardiovascular Disorders. Chapter 39—Holter and Event Monitors. Chapter 44—Cardiac Magnetic Resonance Imaging. Chapter 48—Medications for Treating Cardiovascular Disorders. Chapter 49—Procedures to Treat Narrowed or Blocked Arteries. Section 49.4—Coronary Artery Bypass Grafting. Section 49.5—Stents to Keep Coronary Arteries Open. Chapter 51—Procedures to Treat Heart Valve Problems. Chapter 53—Treating Congenital Heart Defect. Chapter 57—Rehabilitation after Heart Attack or Stroke. Chapter 58—Reduce Heart Health Risks. Chapter 59—Controlling High Blood Pressure. Chapter 61—Steps to Control Diabetes. Section 63.2—Vitamin E and Coronary Heart Disease. Section 63.3—Omega-3 Fatty Acids for Prevention of Heart Disease . Chapter 64—How to Prevent and Control Coronary Heart Disease Risk Factors. Chapter 66—Managing Stress for a Healthy Heart. Chapter 67—Quitting Smoking: Why It Is Important and How to Do It. Chapter 68—Other Interventions to Help Reduce Risk of Cardiovascular Disease. Section 68.1 —Aspirin for Reducing Your Risk of Heart Attack and Stroke. Section 68.2—Chelation for Coronary Heart Disease. Chapter 69—Glossary of Terms Related to Cardiovascular Disorders. 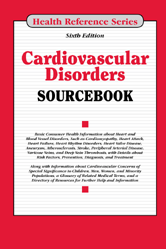 Chapter 70—Directory of Resources Providing Information about Cardiovascular Disorders.